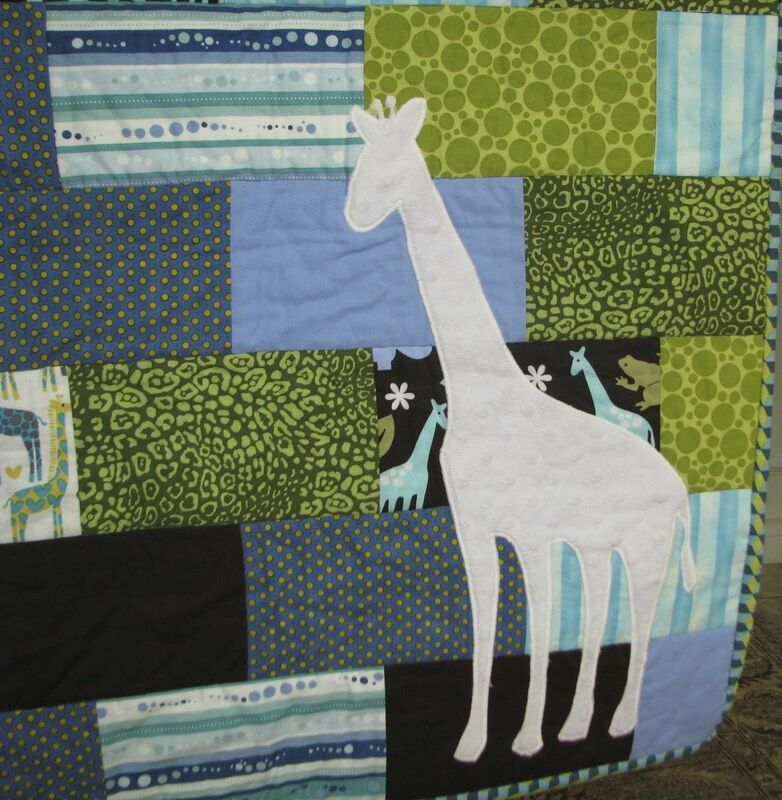 Work-in-Progress Wednesday – The Giraffe Quilt edition. I’ve been busy figuring out exactly how to fit everything in. Biking K to school. Blogging. Sewing and crafting. Gardening. Cooking and laundry and housekeeping. Paying the bills and filing them. Losing weight. Visiting with family and friends. Developing our weekly Shabbat practice. Raising the kids. It’s a lot. I’m convinced that I can keep at least most of those balls in the air as long as I get really, really organized – so that’s what I’ve been doing. I bought an iPod touch so that I can use apps to track all of my to-do’s and shopping lists, my contacts, Kids’ immunization info, and everything else a mom wants to have in her pocket at all times. The only issue is that a system like that takes time to set up, and I’m still at the stage of choosing the right apps. Still, it’s progress. I finally accepted what Mr. December has been telling me all along – I need to remove myself from the main living areas if I ever want to be left alone to get things done. 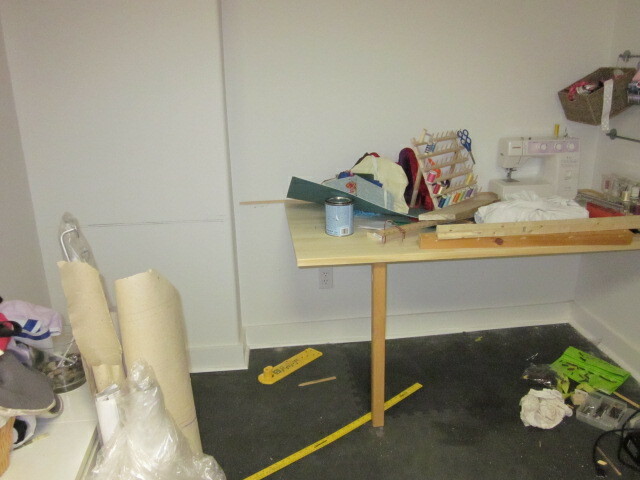 With my built-in sewing table/desk combo finally installed (if not yet sealed,) I’ve taken the laptop to my workshop. Soon I hope to move all my paperwork and bill-filing stuff to the basement as well, which will free up some of the kitchen clutter. I’m looking forward to it. 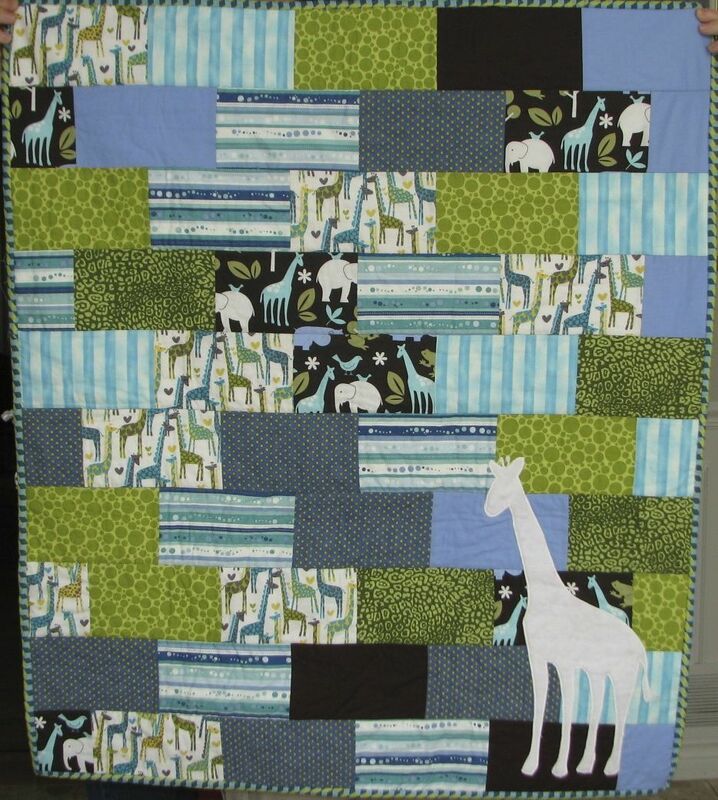 And now, in return for your patience, here’s what you’ve all been dying to see… The Giraffe Quilt! My sister-in-law loves giraffes, and her favourite colours are blues and greens. Finding the giraffe fabrics was the hard part – they only seemed to be available in the U.S. Anyhow, all of the printed fabrics are cotton. 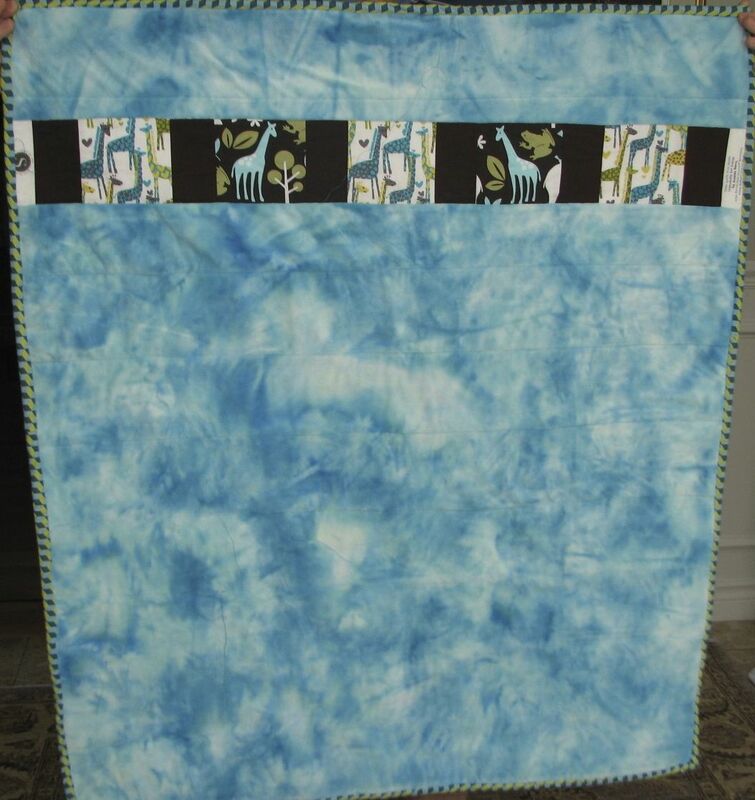 The giraffe applique is white minky with a polka-dot texture. The back is a turquoise tie-dye minky (and it’s so soft!) with a pieced strip near the top. The strip was practical, since I didn’t have a minky piece large enough, and it gave me the opportunity to use my favourite giraffe fabrics again. So that’s the quilt. A labour of love from start to finish. I was actually a bit neglectful when taking the photo, and so you can’t see the whole corner desk (at the left edge of the picture.) It’s there, and it’s my computer workstation. 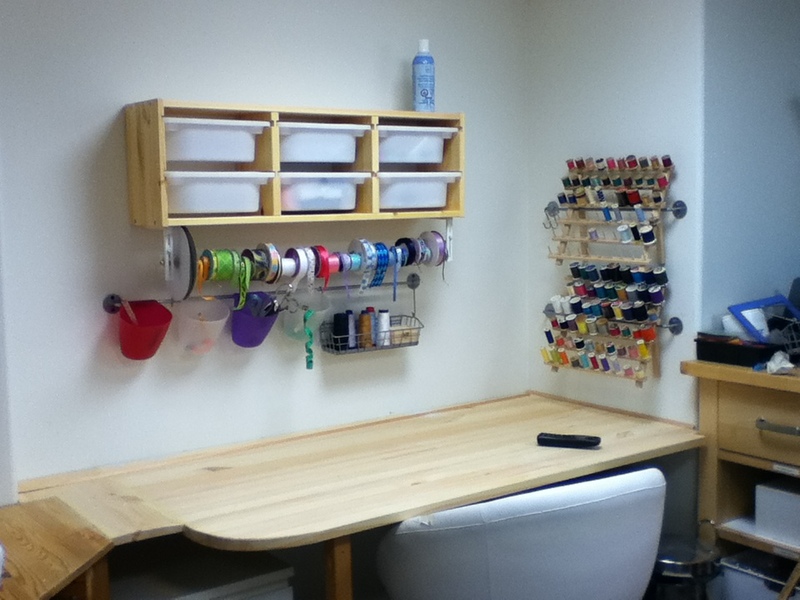 The lovely large table you see is my sewing/cutting/crafting area, flanked by racks of thread on one side and spools of ribbon on another. Next to the corner desk I have another IKEA Trofast unit, whose drawers I use to store current projects. I really do need to use some clear topcoat on it, since it’s natural wood and will eventually get damaged (ahem… I mean, it’ll develop quite the patina…) but that’s not a priority. I’m considering this job complete! I’m down 1.8 pounds this week. Well, something like that. Anyhow, I’m not up and that’s good. I’m pretty sure that my saving grace this week was the fact that I biked at least an hour a day every day but one. This week, I need to really decide on an app to use as a personal organizer, and I need to stick with it. So far Remember the Milk seems to be winning, but I need to spend some time using it in order to be sure. My kids have too many clothes. It’s the downside of Toronto weather: one day they need shorts and tank tops, the next it’s back to jeans and polar fleece. I think, though, that I can now legitimately pack away the winter stuff. I plan to do that tomorrow. Well, that’s it for me. Off to bed now, so that I can bike K to school in the morning. And what are you hoping to achieve this week? 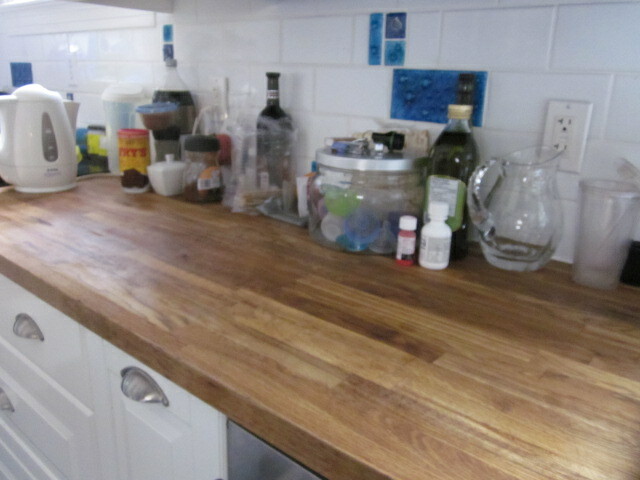 I have wooden countertops in my kitchen, and I love them. I can take a dish straight from the oven and put it on the unprotected counter. I can chop veggies on our counters. They’re even fabulous for kneading bread. The answer to these comments depends, to paraphrase Bill Clinton, on what your definition of the word “ruin” is. Might the hot pans, sharp knives, and water mark the counters? Definitely. Do I care? No. Won’t the counters look ugly? In my opinion, no. They’ll just develop a lovely patina. In case you couldn’t tell, I’m not one of those people. I probably never will be. I only use moisturizer when my skin is dry. My hair is frizzy and I don’t generally use a “product” to correct that. I wear makeup so rarely that if I followed industry guidelines to replacing makeup, each item would become single-use (and prohibitively expensive.) I wear sunscreen when I’m likely to burn, but not just to leave the house and run errands. All these failures on my part will probably guarantee that in thirty years I’ll have wrinkles and freckles in record numbers. Know what? I don’t care. My favourite guitar (yes, I have several) has a nasty crack in it, courtesy of a careless passerby at St. Jacobs farmer’s market, where I used to busk on weekends. It hasn’t affected the sound (not badly, at least,) and to me it’s a reminder that my guitar and I have gone places. Numerous small scratches offer a testament to the times my kids have tried to strum the guitar – admittedly, with materials not suitable for use as picks. The finish is uneven, too: the wood is darker and shinier at the bottom left side of the body, where my strumming arm rests, and at the top end of the neck, where my left hand glides up and down to form the chords. My guitar has a beautiful patina. Our living room has hardwood floors. They look pretty good, considering that they date back to 1946, but there are quite a few shallow scratches, some gouges, and some spots where the stain is starting to look patchy. The scratches are from the kids moving furniture around (mostly their table and chairs,) the gouge is from the time we sold the refrigerator that came from the house (we were doing much of the renovation work ourselves,) and we just happen to rub certain parts of the floor more often than others (hence the uneven finish.) Our floors squeak, too. Every time I take a step, a floorboard says, “yup, lots of people like to walk on me. I’m part of a well-trodden path to the door, and have been for over sixty years!” Our floors have developed a patina. When I think about it, my stuff never stays looking new for long. I spend more time using my things than thinking about how to keep them looking new, and that extends to my body. My hands are scarred from being bitten by autistic campers, cutting myself while installing new gutters, slicing my knuckle while deboning a chicken, and burning myself on my first attempt to fry schnitzel. If I hadn’t done any of those things I suppose my hands wouldn’t be scarred; on the other hand (no pun intended,) I wouldn’t have had any of those experiences. I don’t know about you, but I’m not a person to trade in life experience – and the satisfaction of a job well done – for perfect skin. The word “patina” only ever gets used in reference to materials or objects, but I think it can describe people rather well. People with patina have been places, done things, had adventures, and have the scars to prove it. People without patina may look very pretty, but I can only imagine that the constant preventative measures and maintenance required to keep looking that way take time away from actually living, just as polishing and displaying the guitar would take time away from actually playing it, and keeping the floors scratch-free would mean stopping the kids from playing in there. People with patina have this glow, this energy that tells you they’ve spent their time purposefully. Just as I can sand and oil my countertops, I can clean myself up nicely when the need arises, and the combination of the makeup and the patina is what really makes me shine. I can only hope that my patina, just like the patina of my counters and guitar and home, deepens and becomes more interesting over time. There are so many analogies here that I could go on writing all day. And now it occurs to me that you really can sum up my life’s philosophy in one word: Patina. Experience makes beauty. Repost: It’s not about the dishwasher unless I make it so. This is a repost from a very old blog of mine. Ruchi over at Out of the Ortho Box just posted about this issue, so I dug this one up so that current readers can have a look. I believe this was published in 2009. It still applies today. A friend of mine just wrote a post about how, as an Orthodox Jew, she really regrets that she can’t eat in someone’s house just because they use the same dishwasher for both their meat and dairy utensils. She goes on to talk about how many people accuse the Orthodox of caring more about the dishwasher than about the friendship. I understand why, for an Orthodox Jew, it’s impossible to eat things cooked in my pots and pans, served on my plates. It’s like asking a paraplegic to walk up the steps into my house. Impossible. When that person says no, it’s not a judgment – it’s simply a statement of fact. So I can grouse about how offended I am, about how seriously I take my Judaism and how picky this friend is being. But ultimately, it’s a fruitless exercise. Alternately, I can offer a solution or a compromise: eat in my home, but on paper plates. We’ll order takeout. Or I can cook things in foil pans with single-use utensils. It’s just as if I invited a person who is wheelchair-dependent to my house with stairs. I could build a ramp. It won’t be pretty, or as elegant a reception as I like to offer my guests. There are some parts of my house a wheelchair-dependent person would never be able to see. But we could still enjoy each other’s company, a bite to eat, and stimulating conversation. It’s not about the stairs, just as it’s not about the dishwasher. 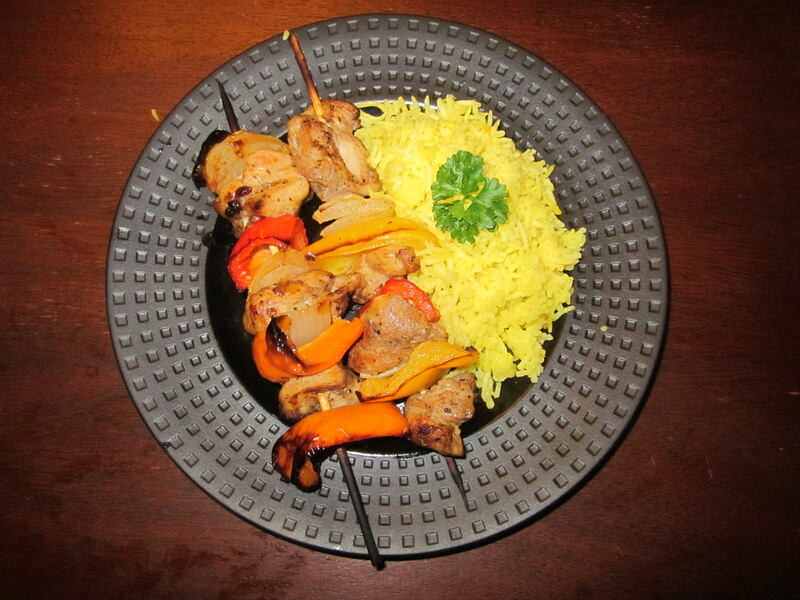 There are some of my much-loved recipes that my Orthodox friends will never taste. That’s unfortunate, but far from a deal-breaker. Where I come from, hachnassat orchim (welcoming guests) is taken very seriously. It’s about accommodating your guests to the best of your ability, and seeing to their needs, not to your own. And so I’m choosing to overlook the small sting to my pride and build the metaphorical ramp. And when we all sit around the table in the succah, breaking bread and celebrating together, the dishwasher won’t even be relevant. It’s been nice, being away and not having to think about what to cook. Oh, I did my fair share of cooking, but my brother was the head chef and the rest of us were just sous-chefs following orders. Good thing I have a sous-chef of sorts in our part-time nanny, who is happy to chop and prepare and generally keep us in cut veggies and rinsed fruit. I’ve been gone from the blog a long, long time. Tonight I’ll give you the factual rundown on what I’ve been doing, and then I’ll do some other, more reflective, or maybe photographic, blogging this week. Right. So when I left off, I was going to prioritize exercise and sleep, yes? I did that. Well, actually I prioritized exercise, but sleep suffered as a result. In response I increased my coffee intake and cemented my status as a newborn coffee addict. Anybody want to recommend a good coffee machine? Next, everything happened, all at once. 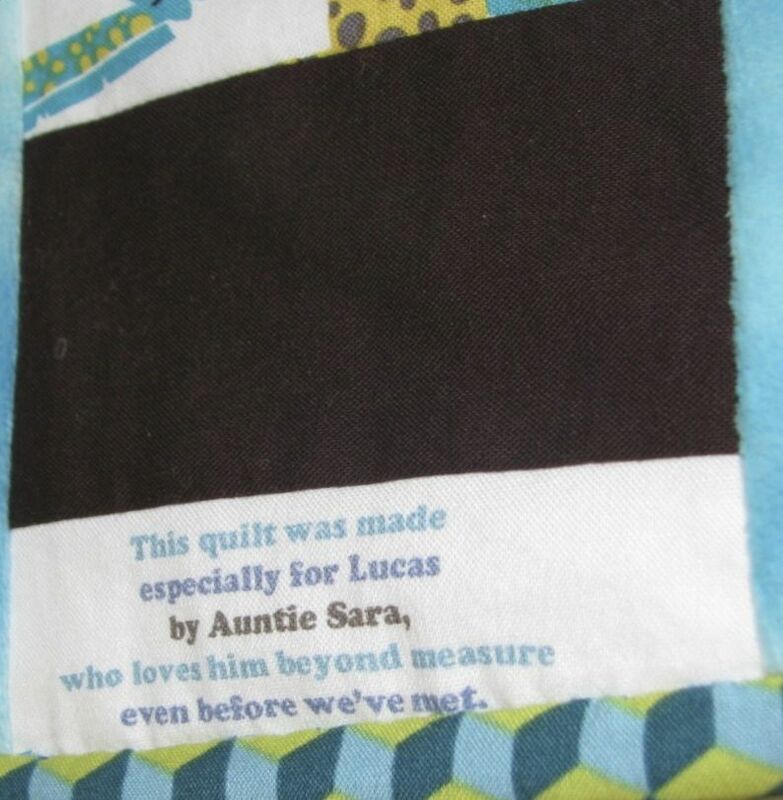 The designer fabrics for my nephew’s quilt finally arrived in my mailbox, the same day that my sister-in-law went into labour. I decided that I’d go to Vancouver for the bris, and from that moment on I was hell-bent on getting the quilt finished in time to take it with me (for those feeling clueless, the bris is held on the baby’s eighth day of life, which meant that I had just under a week to start and finish a quilt.) 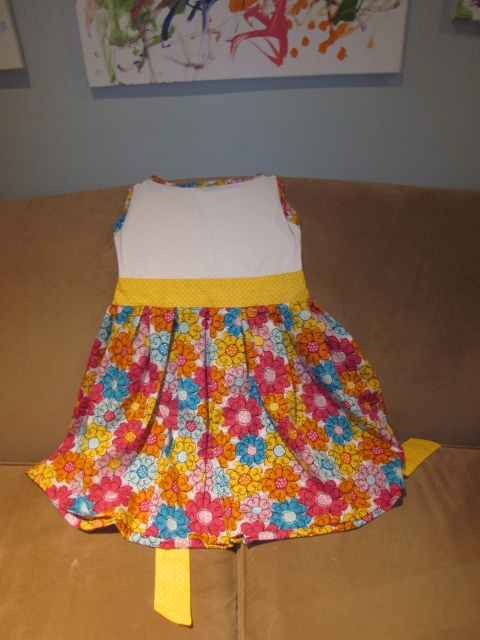 Every spare second was spent cutting, designing, sewing, ironing… I managed to finish it. What I didn’t manage to do was take a picture on my camera, so now I’m at the mercy of my brother and sis-in-law to send me the photos from their DSLR. I traveled to Vancouver with a baby and a four-year-old, both of whom totally aced the flight. They were fabulous. We spent four days there and returned last night (this morning?) around 2:00 a.m. I didn’t fall asleep until after three. That’s pretty much it, actually. A lot of quilting (and I discovered an awesome local quilt shop that makes me wish I could buy everything in it.) A lot of travel. Some touristy stuff, a bris, a lot of eating, and some cooing at a gorgeous baby boy – my first nephew. And now I’m back, and my to-do list is several miles long. Let the fun begin! Wow, I’m posting this on Wednesday! Hooray for punctuality! I’ve been getting stuff done and I have lots to show you. I think I’ve spent maybe four hours on this dress so far, and all I need to do now is hem the bottom and add a little invisible snap to the neck opening. 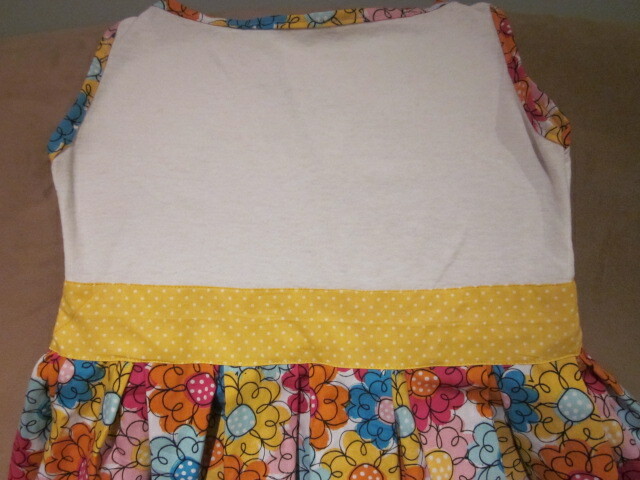 This dress should be ready for its debut on Friday. Today I bought a new desk (well, a tabletop) and mounted it on the walls in the corner where my sewing machine has always been. 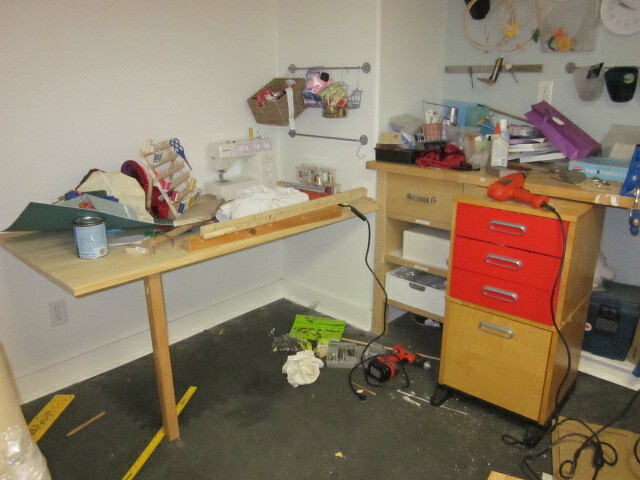 I also hauled out my old corner desk – the top only, since I cannibalized the legs and aprons for other projects over the years – and have started mounting it right beside the new tabletop to make one long, deep workspace. My hope is to have a desk large enough for cutting fabric, as well as space for my sewing machine and possibly even space to sit and work at my computer. I really need to stop using the living room as my base camp if I want to be able to work uninterrupted by the little people. So that’s moving along nicely. I hope that by tomorrow night the desk installation will be complete. That way I can sand and seal it and let it dry over Shabbat. Holy cow, y’all. I gained four pounds this week. FOUR! I mean, yeah, I ate a fair bit of chocolate. And I developed a coffee habit, but I still hate the flavour, so I have to add chocolate syrup and lots of sugar, and milk… And Mr. December wanted to go to pancake-filled Golden Griddle for brunch instead of the salad-heavy Aroma. And we celebrated my brother’s birthday at an Italian restaurant. And I didn’t make time for exercise all week. Hmm. I’m starting to see where I went wrong. This week I’m going to focus on drinking more water (because often I eat when I’m thirsty) and getting a minimum of 30 minutes of exercise every day (with the possible exception of Shabbat.) If four pounds can suddenly appear, surely they can disappear just as suddenly with the right effort. Right? These are all ongoing projects, so I have no new ones to report. I do hope to start posting more frequently, but I need to prioritize exercise and sleep right now. Thanks for bearing with me. … and what are you trying to accomplish this week?